I've been meaning to post to you my letter which ran in the New York Times Sunday August 1. It was a response to a June 27 article Taking Children to Exotic Places which told parents to use disposable diapers when traveling. I spent three months traveling with my baby daughter in India, and I have one tip contrary to Martha Stevenson Olson's advice: forget disposable diapers for travel and use cloth diapers instead. Disposables, especially those with plastic exteriors, are too hot for warm countries. They cause diaper rash, and public health problems in developing countries without good trash collection and landfills. It's also inconvenient to have to keep looking for poorly made disposables at twice the United States price. I brought my cloth diapers to India, and this turned out to be a wonderful convenience. I never ran out, and they were washed daily for a minimal charge at all hotels and resorts. 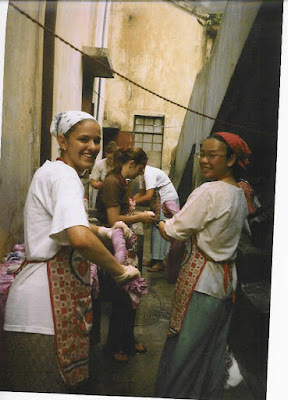 While staying in a private home in Calcutta, I contacted an agency providing a cheerful young woman to wash baby laundry, and do nanny duty -- all for just $1.50 a day. I bet similar excellent help is available in other countries. Thanks to Sujata for this Frugal Baby Tip!